KVERT reported that the S fissure along the W side of Tolbachinsky Dol, a lava plateau on the SW side of Tolbachik, continued to produce very fluid lava flows during 16-22 August that traveled to the W, S, and E sides of the plateau. Cinder cones continued to grow along the S fissure and weak gas-and-steam plumes were observed. A thermal anomaly on the N part of Tolbachinsky Dol was visible daily in satellite imagery. Seismic activity decreased during 22-24 August. Video images showed no incandescence from the N part of Tolbachinsky Dol, although a thermal anomaly continued to be detected in satellite images. On 27 August the Aviation Color Code was lowered to Yellow. The most recent eruption began on 27 November 2012 along two fissures a few kilometers S of the main Tolbachik edifice, within the Tolbachinsky Dol lava plateau (BGVN 37:12). Monitoring is done by the Kamchatkan Volcanic Eruption Response Team (KVERT); they recorded an end date for this eruption as 15 September 2013. Activity reported through February 2013 included Strombolian fire fountains (figure 14), voluminous lava flows on the surface (figure 15 and 16) and under the ice and snow cover (figure 17), ash explosions, and the building of cinder cones (BGVN 37:12). 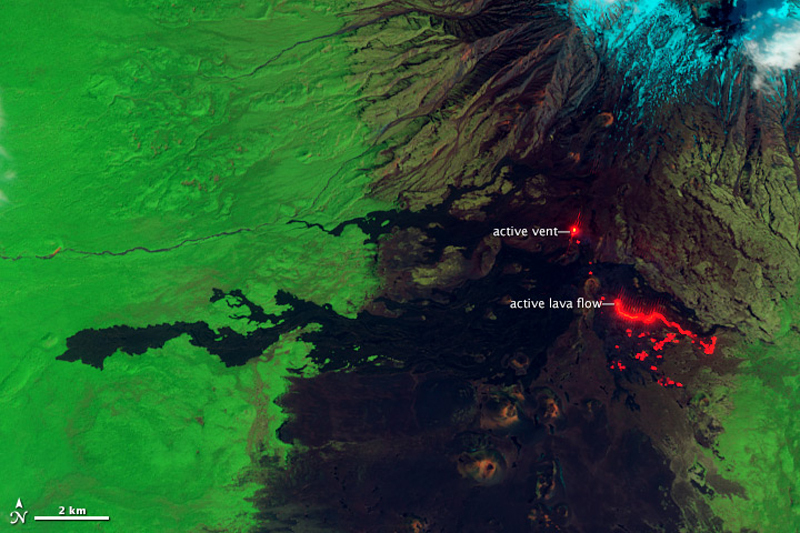 Satellite imagery in early June 2013 revealed both a lava pond at the active vent and a large lava flow lower down the flank, with multiple flow-front breakouts (figure 18). Cinder cones continued to grow along the S fissure through 16-22 August 2013, and lava flows remained active (figure 19), but then gas-and-ash plumes weakened and seismicity decreased during the last week of the month (BGVN 38:08). Figure 14. Lava fountain in the cinder cone at Tolbachik on 24 January 2013. Photo by Yu. Demyanchuk; courtesy of IVS FEB RAS and KVERT. Figure 15. Photo of lava flow at Tolbachik on 25 January 2013. Photo by Yu. Demyanchuk; courtesy of IVS FEB RAS and KVERT. Figure 16. Lava flows moving ESE at Tolbachik on 25 February 2013. Photo by Yu. Demyanchuk; courtesy of IVS FEB RAS and KVERT. Figure 17. Photo of a lava flow intruding under deep snow at Tolbachik on 25 February 2013. Photo by Yu. Demyanchuk; courtesy of IVS FEB RAS and KVERT. Figure 18. False-color image of Tolbachinsky in shortwave infrared and near-infrared light (combined with green light), taken on 6 June 2013 by the Advanced Land Imager on the Earth Observing-1 satellite. Hot surfaces glow in shortwave infrared wavelengths. The active vent and lava flow are bright red, along with scattered lava "breakouts"at the front of the flow. High temperature surfaces in the scene also glow in near infrared light, revealing a lava pond in the active vent and fluid lava in the center of the lava flow. Courtesy of NASA (image by Jesse Allen and Robert Simmon, caption by Robert Simmon). Figure 19. Photo of lava flow front adjacent to the Kruglenkaya slag cone at Tolbachik on 16 August 2013. Photo by D.V. Melnikov; courtesy of IVS FEB RAS and KVERT. Seismicity continued to decrease during 22-24 August 2013, and KVERT noted on 27 August that no incandescence had been seen in recent days, and there were no current ash plumes. Satellite data did still show a large thermal anomaly in the northern area of Tolbachinsky Dol, which KVERT attributed to the lava flows remaining hot. The MODIS thermal anomaly data recorded in the MODVOLC system identified the latest hotspot on 27 August 2013. According to the Kamchatkan Volcanic Eruption Response Team (KVERT), the Aviation Color Code (ACC) was lowered from Orange to Yellow on 27 August 2013. When the ACC was lowered to Green on 31 January 2014, KVERT reported that weak seismic activity and episodes of tremor continued, gas-and-steam activity was sometimes observed, and satellite data continued to show a weak thermal anomaly. However, they also stated that "probably its active phase was finishing in September 2013." The KVERT website recorded an end date of 15 September 2013. The new lava flows were still noticeable in visible satellite imagery more than a year after the eruption ended (figure 20). Figure 20. Satellite image from Landsat/Copernicus showing the final extent of new lava flows on the SSW flank of Tolbachik on 30 December 2014. The new lava flows extend across the center of the image, with the main edifice at top right. Color and contrast have been adjusted to enhance the contrast between fresh darker lava and faded older deposits. Courtesy of Google Earth. Information Contacts: Kamchatka Volcanic Eruptions Response Team (KVERT), Far Eastern Branch, Russian Academy of Sciences, 9 Piip Blvd., Petropavlovsk-Kamchatsky, 683006, Russia (URL: http://www.kscnet.ru/ivs/kvert/); Institute of Volcanology and Seismology, Far Eastern Branch, Russian Academy of Sciences (IVS FEB RAS), 9 Piip Blvd., Petropavlovsk-Kamchatsky 683006, Russia (URL: http://www.kscnet.ru/ivs/eng/); Hawai'i Institute of Geophysics and Planetology (HIGP) - MODVOLC Thermal Alerts System, School of Ocean and Earth Science and Technology (SOEST), Univ. of Hawai'i, 2525 Correa Road, Honolulu, HI 96822, USA (URL: http://modis.higp.hawaii.edu/); NASA Earth Observatory, EOS Project Science Office, NASA Goddard Space Flight Center, Goddard, Maryland, USA (URL: http://earthobservatory.nasa.gov/); Google Earth (URL: https://www.google.com/earth/). KVERT reported that the S fissure along the W side of Tolbachinsky Dol, a lava plateau on the SW side of Tolbachik, continued to produce very fluid lava flows during 9-17 August that traveled to the W, S, and E sides of the plateau. Cinder cones continued to grow along the S fissure and weak gas-and-steam plumes were observed. A thermal anomaly on the N part of Tolbachinsky Dol was visible daily in satellite imagery. The Aviation Color Code remained at Orange. KVERT reported that the S fissure along the W side of Tolbachinsky Dol, a lava plateau on the SW side of Tolbachik, continued to produce very fluid lava flows during 2-9 August that traveled to the W, S, and E sides of the plateau. Cinder cones continued to grow along the S fissure and weak gas-and-steam plumes were observed. A thermal anomaly on the N part of Tolbachinsky Dol was visible daily in satellite imagery. The Aviation Color Code remained at Orange. KVERT reported that the S fissure along the W side of Tolbachinsky Dol, a lava plateau on the SW side of Tolbachik, continued to produce very fluid lava flows during 26 July-2 August that traveled to the W, S, and E sides of the plateau. Cinder cones continued to grow along the S fissure and weak gas-and-steam plumes were observed. A thermal anomaly on the N part of Tolbachinsky Dol was visible daily in satellite imagery. The Aviation Color Code remained at Orange. KVERT reported that the S fissure along the W side of Tolbachinsky Dol, a lava plateau on the SW side of Tolbachik, continued to produce very fluid lava flows during 19-26 July that traveled to the W, S, and E sides of the plateau. Cinder cones continued to grow along the S fissure and weak gas-and-steam plumes were observed. A thermal anomaly on the N part of Tolbachinsky Dol was visible daily in satellite imagery. The Aviation Color Code remained at Orange. KVERT reported that the S fissure along the W side of Tolbachinsky Dol, a lava plateau on the SW side of Tolbachik, continued to produce very fluid lava flows during 12-19 July that traveled to the W, S, and E sides of the plateau. Cinder cones continued to grow along the S fissure and weak gas-and-steam plumes were observed. A large thermal anomaly on the N part of Tolbachinsky Dol was visible daily in satellite imagery. The Aviation Color Code remained at Orange. KVERT reported that the S fissure along the W side of Tolbachinsky Dol, a lava plateau on the SW side of Tolbachik, continued to produce very fluid lava flows during 5-12 July that traveled to the W, S, and E sides of the plateau. Cinder cones continued to grow along the S fissure and weak gas-and-steam plumes were observed. A large thermal anomaly on the N part of Tolbachinsky Dol was visible daily in satellite imagery. The Aviation Color Code remained at Orange. KVERT reported that the S fissure along the W side of Tolbachinsky Dol, a lava plateau on the SW side of Tolbachik, continued to produce very fluid lava flows during 28 June-5 July that traveled to the W, S, and E sides of the plateau. Cinder cones continued to grow along the S fissure and weak gas-and-steam plumes were observed. A large thermal anomaly on the N part of Tolbachinsky Dol was visible daily in satellite imagery. The Aviation Color Code remained at Orange. KVERT reported that the S fissure along the W side of Tolbachinsky Dol, a lava plateau on the SW side of Tolbachik, continued to produce very fluid lava flows during 21-28 June that traveled to the W, S, and E sides of the plateau. Cinder cones continued to grow along the S fissure and weak gas-and-steam plumes were observed. A large thermal anomaly on the N part of Tolbachinsky Dol was visible daily in satellite imagery. The Aviation Color Code remained at Orange. KVERT reported that the S fissure along the W side of Tolbachinsky Dol, a lava plateau on the SW side of Tolbachik, continued to produce very fluid lava flows during 14-21 June that traveled to the W, S, and E sides of the plateau. Cinder cones continued to grow along the S fissure and weak gas-and-steam plumes were observed. A large thermal anomaly on the N part of Tolbachinsky Dol was visible daily in satellite imagery. The Aviation Color Code remained at Orange. KVERT reported that the S fissure along the W side of Tolbachinsky Dol, a lava plateau on the SW side of Tolbachik, continued to produce very fluid lava flows during 7-14 June that traveled to the W, S, and E sides of the plateau. Cinder cones continued to grow along the S fissure and weak gas-and-steam plumes were observed. A large thermal anomaly on the N part of Tolbachinsky Dol was visible daily in satellite imagery. The Aviation Color Code remained at Orange. KVERT reported that the S fissure along the W side of Tolbachinsky Dol, a lava plateau on the SW side of Tolbachik, continued to produce very fluid lava flows during 24-31 May that traveled to the W, S, and E sides of the plateau. Cinder cones continued to grow along the S fissure and weak gas-and-steam plumes were observed. A large thermal anomaly on the N part of Tolbachinsky Dol was visible daily in satellite imagery. The Aviation Color Code remained at Orange. KVERT reported that the S fissure along the W side of Tolbachinsky Dol, a lava plateau on the SW side of Tolbachik, continued to produce very fluid lava flows during 17-24 May that traveled to the W, S, and E sides of the plateau. Cinder cones continued to grow along the S fissure and weak gas-and-steam plumes were observed. A large thermal anomaly on the N part of Tolbachinsky Dol was visible daily in satellite imagery. The Aviation Color Code remained at Orange. KVERT reported that the S fissure along the W side of Tolbachinsky Dol, a lava plateau on the SW side of Tolbachik, continued to produce very fluid lava flows during 10-16 May that traveled to the W, S, and E sides of the plateau. Cinder cones continued to grow along the S fissure and gas-and-ash plumes were observed. A large thermal anomaly on the N part of Tolbachinsky Dol was visible daily in satellite imagery. The Aviation Color Code remained at Orange. KVERT reported that the S fissure along the W side of Tolbachinsky Dol, a lava plateau on the SW side of Tolbachik, continued to produce very fluid lava flows during 3-10 May that traveled to the W, S, and E sides of the plateau. Cinder cones continued to grow along the S fissure and gas-and-ash plumes were observed. A large thermal anomaly on the N part of Tolbachinsky Dol was visible daily in satellite imagery. The Aviation Color Code remained at Orange. KVERT reported that the S fissure along the W side of Tolbachinsky Dol, a lava plateau on the SW side of Tolbachik, continued to produce very fluid lava flows during 19-26 April that traveled to the W, S, and E sides of the plateau. Cinder cones continued to grow along the S fissure. Gas-and-ash plumes rose to an altitude of 3 km (10,000 ft) a.s.l. and drifted in multiple directions. A large thermal anomaly on the N part of Tolbachinsky Dol was visible daily in satellite imagery. The Aviation Color Code remained at Orange. KVERT reported that the S fissure along the W side of Tolbachinsky Dol, a lava plateau on the SW side of Tolbachik, continued to produce very fluid lava flows during 12-19 April that traveled to the W, S, and E sides of the plateau. Cinder cones continued to grow along the S fissure. Gas-and-ash plumes rose to an altitude of 3 km (10,000 ft) a.s.l. and drifted in multiple directions. A large thermal anomaly on the N part of Tolbachinsky Dol was visible daily in satellite imagery. The Aviation Color Code remained at Orange. KVERT reported that the S fissure along the W side of Tolbachinsky Dol, a lava plateau on the SW side of Tolbachik, continued to produce very fluid lava flows during 5-12 April that traveled to the W, S, and E sides of the plateau. Cinder cones continued to grow along the S fissure. Gas-and-ash plumes rose to an altitude of 3.5 km (11,500 ft) a.s.l. and drifted in multiple directions. A very large thermal anomaly on the N part of Tolbachinsky Dol was visible daily in satellite imagery. A weak thermal anomaly was detected over the crater of the volcano on 6 and 9 April. The Aviation Color Code remained at Orange. KVERT reported that the S fissure along the W side of Tolbachinsky Dol, a lava plateau on the SW side of Tolbachik, continued to produce very fluid lava flows during 29 March-5 April that traveled to the W, S, and E sides of the plateau. Cinder cones continued to grow along the fissure. Gas-and-ash plumes rose to an altitude of 3.5 km (11,500 ft) a.s.l. and drifted in multiple directions. A very large thermal anomaly on the N part of Tolbachinsky Dol was visible daily in satellite imagery. The Aviation Color Code remained at Orange. KVERT reported that the S fissure along the W side of Tolbachinsky Dol, a lava plateau on the SW side of Tolbachik, continued to produce very fluid lava flows during 22-29 March that traveled to the W, S, and E sides of the plateau. Cinder cones continued to grow along the fissure. Gas-and-ash plumes rose to an altitude of 3.5 km (11,500 ft) a.s.l. and drifted in multiple directions. A very large thermal anomaly on the N part of Tolbachinsky Dol was visible daily in satellite imagery. The Aviation Color Code remained at Orange. KVERT reported that the S fissure along the W side of Tolbachinsky Dol, a lava plateau on the SW side of Tolbachik, continued to produce very fluid lava flows during 15-22 March that traveled to the W, S, and E sides of the plateau. Cinder cones continued to grow along the fissure. Gas-and-ash plumes rose to an altitude of 3.5 km (11,500 ft) a.s.l. and drifted in multiple directions. A very large thermal anomaly on the N part of Tolbachinsky Dol was visible daily in satellite imagery. The Aviation Color Code remained at Orange. KVERT reported that the S fissure along the W side of Tolbachinsky Dol, a lava plateau on the SW side of Tolbachik, continued to produce very fluid lava flows during 8-15 March that traveled to the W, S, and E sides of the plateau. Cinder cones continued to grow along the fissure. Gas-and-ash plumes rose to an altitude of 3.5 km (11,500 ft) a.s.l. and drifted in multiple directions. A very large thermal anomaly on the N part of Tolbachinsky Dol was visible daily in satellite imagery. The Aviation Color Code remained at Orange. KVERT reported that the S fissure along the W side of Tolbachinsky Dol, a lava plateau on the SW side of Tolbachik, continued to produce very fluid lava flows during 22 February-1 March that traveled to the W, S, and E sides of the plateau. Cinder cones continued to grow on the fissure. Gas-and-ash plumes rose to an altitude of 3.5 km (11,500 ft) a.s.l. and drifted in multiple directions. A very large thermal anomaly on the N part of Tolbachinsky Dol was visible daily in satellite imagery. The Aviation Color Code remained at Orange. KVERT reported that the S fissure along the W side of Tolbachinsky Dol, a lava plateau on the SW side of Tolbachik, continued to produce very fluid lava flows during 15-22 February that traveled to the W, S, and SE sides of the plateau. Four cinder cones continued to grow on the S fissure above Krasny cone. Gas-and-ash plumes rose to an altitude of 3.5 km (11,500 ft) a.s.l. and drifted in multiple directions. A very large thermal anomaly on the N part of Tolbachinsky Dol was visible daily in satellite imagery. The Aviation Color Code remained at Orange. KVERT reported that the S fissure along the W side of Tolbachinsky Dol, a lava plateau on the SW side of Tolbachik, continued to produce very fluid lava flows during 8-15 February that traveled to the W, S, and SE sides of the plateau. Four cinder cones continued to grow on the S fissure above Krasny cone. Gas-and-ash plumes rose to an altitude of 3.5 km (11,500 ft) a.s.l. and drifted in multiple directions. A very large thermal anomaly on the N part of Tolbachinsky Dol was visible daily in satellite imagery. The Aviation Color Code remained at Orange. KVERT reported that the S fissure along the W side of Tolbachinsky Dol, a lava plateau on the SW side of Tolbachik, continued to produce very fluid lava flows during 25 January-1 February that traveled to the W and S sides of Tolbachinsky Dol. Four cinder cones continued to grow on the S fissure above Krasny cone. Gas-and-ash plumes rose to an altitude of 3.5 km (11,500 ft) a.s.l. and drifted in multiple directions. A very large thermal anomaly on the N part of Tolbachinsky Dol was visible daily in satellite imagery. The Aviation Color Code remained at Orange. KVERT reported that the S fissure along the W side of Tolbachinsky Dol, a lava plateau on the SW side of Tolbachik, continued to produce very fluid lava flows during 18-25 January that traveled to the W and S sides of Tolbachinsky Dol. Four cinder cones continued to grow on the S fissure above Krasny cone. Gas-and-ash plumes rose to an altitude of 4 km (13,100 ft) a.s.l. and drifted in multiple directions. A very large thermal anomaly on the N part of Tolbachinsky Dol was visible daily in satellite imagery. The Aviation Color Code remained at Orange. KVERT reported that the S fissure along the W side of Tolbachinsky Dol, a lava plateau on the SW side of Tolbachik, continued to produce very fluid lava flows during 11-18 January that traveled to the W and S sides of Tolbachinsky Dol. Gas-and-ash plumes rose to an altitude of 4 km (13,100 ft) a.s.l. and drifted in multiple directions. A very large thermal anomaly on the N part of Tolbachinsky Dol was visible daily in satellite imagery. The Aviation Color Code remained at Orange. KVERT reported that the S fissure along the W side of Tolbachinsky Dol, a lava plateau on the SW side of Tolbachik, continued to produce very fluid lava flows during 4-15 January that traveled to the W and SE sides of Tolbachinsky Dol. Gas-and-ash plumes rose to an altitude of 4.5 km (14,800 ft) a.s.l. and drifted in multiple directions. A very large thermal anomaly on the N part of Tolbachinsky Dol was visible daily in satellite imagery. The Aviation Color Code remained at Orange. KVERT reported that the S fissure along the W side of Tolbachinsky Dol, a lava plateau on the SW side of Tolbachik, continued to produce very fluid lava flows during 28 December-8 January. Strong seismicity was detected. Gas-and-ash plumes drifted in multiple directions, and a fifth cone continued to grow above the fissure. A very large thermal anomaly on the N part of Tolbachinsky Dol was visible daily in satellite imagery. The Aviation Color Code remained at Orange. Based on information from KVERT, the Tokyo VAAC reported that on 7 January an ash plume rose to altitudes of 3.7-4.3 km (12,000-14,000 ft) a.s.l. and drifted NE. KVERT reported that the S fissure along the W side of Tolbachinsky Dol, a lava plateau on the SW side of Tolbachik, continued to produce very fluid lava flows during 21-28 December. Strong seismicity was detected. Gas-and-ash plumes drifted in multiple directions, and a fifth cone continued to grow above the fissure. A very large thermal anomaly on the N part of Tolbachinsky Dol was visible daily in satellite imagery. The Aviation Color Code remained at Orange. KVERT reported that the S fissure along the W side of Tolbachinsky Dol, a lava plateau on the SW side of Tolbachik, continued to produce very fluid lava flows that traveled 17-20 km during 17-21 December. Strong seismicity was detected. Gas-and-ash plumes drifted in multiple directions, and a fifth cone grew above the fissure. A very large thermal anomaly on the N part of Tolbachinsky Dol was visible in satellite imagery. The Aviation Color Code remained at Orange. KVERT reported that the S fissure along the W side of Tolbachinsky Dol, a lava plateau on the SW side of Tolbachik, continued to produce very fluid lava flows that traveled 17-20 km during 7-17 December. Strong seismicity was detected. Ash plumes rose less than 1 km and drifted in multiple directions, and at least two cones grew above the fissure. A very large thermal anomaly on the N part of Tolbachinsky Dol was visible in satellite imagery. The Aviation Color Code remained at Orange. KVERT reported that the eruption from Tolbachik that began on 27 November continued through 8 December. A very large thermal anomaly on the N part of Tolbachinsky Dol, a lava plateau on the SW side of the volcano, was reported daily. Lava effused from two fissures along the W side of Tolbachinsky Dol; lava had flowed 17-20 km away from the S fissure by 7 December. Ash plumes rose less than 500 m during 1-5 December, and minor ashfall was reported in Kozyrevsk (40 km NW) and Klyuchi (65 km NW) villages on 3 December. Gas-and-steam plumes drifted 250 km SE on 5 December, and rose as high as 1 km during 7-11 December and drifted SW and W. The Aviation Color Code remained at Orange. KVERT reported that an eruption from Tolbachik that began on 27 November continued through 30 November. Lava effused from two fissures along the W side of Tolbachinsky Dol, a lava plateau on the SW side of the volcano, and ash plumes rose less than 500 m on 28 November. A large thermal anomaly was detected on the N part of Tolbachinsky Dol. On 29 November the Aviation Color Code was raised to Red. Ash plumes rose less than 500 m and drifted 300 km ESE. Later that day seismicity decreased and the Aviation Color Code was lowered to Orange. During 29 November-1 December Strombolian activity and lava effusion from two fissures continued. A large thermal anomaly continued to be detected in satellite imagery, and ashfall was reported in Kozyrevsk (40 km NW). According to a news article on 30 November, the lava flows destroyed two scientific base camps 10 km away. On 1 December gas-and-steam plumes with small amounts of ash rose over 400 m.
Based on information from UHPP (Yelizovo Airport), the Tokyo VAAC reported that ash plumes rose to altitudes of 4-6.1 km (13,000-20,000 ft) a.s.l. and drifted N and NW during 29-30 November and 3 December. KVERT reported that episodes of volcanic tremor were detected in the area of Plosky Tolbachik during 7-10, 18, and 26 November. The number of shallow volcanic earthquakes increased to 250 on 26 November. A strong event occurred at 1652 on 27 November. The Aviation Color Code was raised to Yellow. That same day observers from Kozyrevsk (40 km NW) and Lazo (50 km SW) villages reported ash explosions and lava flows at Tolbachinsky Dol, in the same area as the 1975 eruption (northern vents). Ashfall, 4 cm thick, was reported in Krasny Yar (60 km NNW). The Aviation Color Code was raised to Orange. Based on information from the Kamchatka Branch of Geophysical Services (KGBS), the Tokyo VAAC reported that ash plumes possibly rose to altitudes of 6.1-10.1 km (20,000-33,000 ft) a.s.l. Ash plumes were not detected in satellite imagery. Plume altitudes were estimated based on seismic data. The following cable was received [on] 25 September 1970. "Plosky Tolbachik: Lava appeared in crater; weak scoria outbursts few meters height." Information Contacts: Y.M. Doubik, Institute of Volcanology, Petropavlovsk. The eruption of Plosky Tolbachik volcano commenced from the flank craters on 6 July 1975 at 0045 GMT. Four explosion vents located 18 km from the main crater are active. The place and time of eruption were predicted by Dr. Tokarev according to the character of the seismic activity. Information Contacts: Y. Doubik, IVP. A volcanic cone 250 m high and 1,200 m in diameter has formed on the south slope of Plosky Tolbachik volcano. Violent activity was observed from 9 to 23 July, producing an ash column 8 km high and bomb outbursts up to 2,500 m. The ashfall area covers 200 km2, and the total of the ash and scoria amounts to 500 m3. On 30 July a lava outflow began issuing from a 1-km-long eruptive fissure on the southwest slope of the new volcanic cone. There is a danger of forest fires. The eruption of Plosky Tolbachik volcano, which started in July 1975, is continuing. Plosky Tolbachik has been in a state of eruption for almost a year. It was reported on 17 May that a new volcano was developing near there, and a group of IVP scientists is investigating the eruption. They stated that "this is one of the biggest and most interesting volcanic eruptions this century." 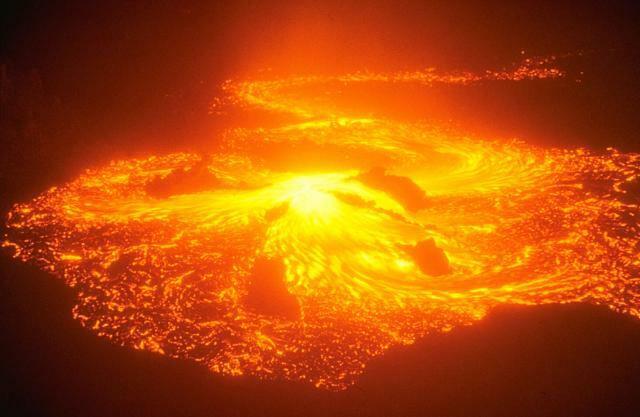 Reportedly, a chain of new volcanoes was formed during the eruption, four of which are fairly large. "Streams of fire" have been active for nearly a year. Seismic monitoring . . . by the KVERT began in late January 1994 when two stations were installed. Since then seismicity was considered to be at background levels. One earthquake was registered on 25 January. During the period from 28 January to 2 February, shallow volcanic earthquakes were registered at a rate of 5-13/day. The following week (3-8 February) there were 1-4 shallow earthquakes recorded each day. Information Contacts: V. Kirianov, IVGG; T. Miller, AVO. On 18 February, a gas-and-steam explosion generated a plume to 600 m above the volcano. Small (magnitudes near zero) shallow earthquakes were registered under the volcano and continued through the month, coincident with M 1.5 events at 15-30 km depth. No further unusual seismicity was reported as of mid-March. The massive Tolbachik basaltic volcano is located at the southern end of the dominantly andesitic Kliuchevskaya volcano group. The Tolbachik massif is composed of two overlapping, but morphologically dissimilar volcanoes. The flat-topped Plosky Tolbachik shield volcano with its nested Holocene Hawaiian-type calderas up to 3 km in diameter is located east of the older and higher sharp-topped Ostry Tolbachik stratovolcano. Lengthy rift zones extending NE and SSW of the volcano have erupted voluminous basaltic lava flows during the Holocene, with activity during the past two thousand years being confined to the narrow axial zone of the rifts. 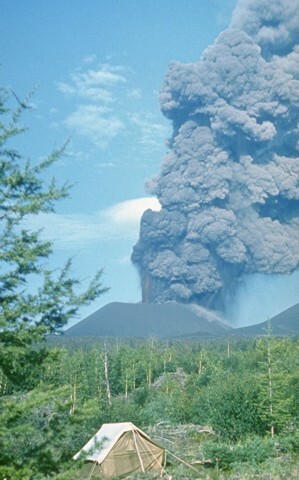 The last eruptive activity, in 1975-76, vented from both the summit and SSW-flank fissures; it was the largest historical basaltic eruption in Kamchatka. Nearly 36 years after its last eruption, the largest basaltic eruption in Kamchatka during historic times (1975/76 eruptions; CSLP 51-75; SEAN 01:07, 01:08), Tolbachik (figure 1) began erupting again on 27 November 2012 following almost three weeks of episodic volcanic tremor. The eruption emerged as two fissures along the W side of Tolbachinsky Dol (a lava plateau along the SW flank of Tolbachik), in the same area as the northern vents of the 1975/76 eruptions. The eruption produced both effusive lava flows and explosions that generated low-level ash-bearing plumes. Figure 1. Shuttle Radar Topography Mission (SRTM) colored elevation and shaded relief map highlighting the location of Tolbachik at the S end of the Kliuchevskoi (Kliuchevskaya) volcanic group, Kamchatka Peninsula, Russia (inset shows regional setting, with the Kamchatka peninsula highlighted in dark gray at the top right, and the location of the Kliuchevskoi volcanic group indicated by the star). Tolbachik comprises the flat-topped Plosky Tolbachik shield volcano (and its nested calderas) to the E and the sharp-topped Ostry Tolbachik stratovolcano to the W. SRTM map modified from NASA Jet Propulsion Laboratory; inset regional map modified from Wikipedia. 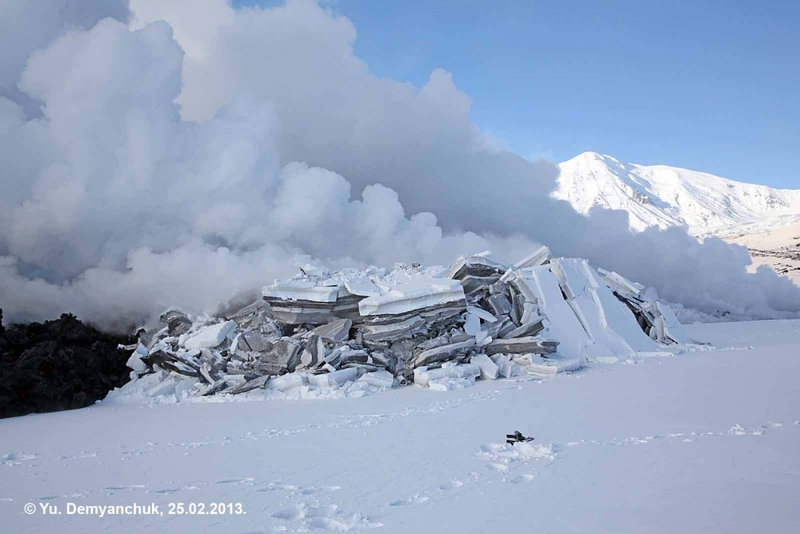 This report mainly summarizes Kamchatkan Volcanic Eruption Response Team (KVERT) daily and weekly reports and information releases concerning the ongoing (as of early February 2013) Tolbachik fissure eruption. Seismicity preceding 27 November 2012 eruption. Episodic tremor was recorded at Tolbachik during 7-10, 18, and 26 November 2012; KVERT noted a distinct difference between these episodes of tremor and discrete events that had occurred over "many years" prior. Shallow volcanic earthquakes began on 26 November, increasing in number to ~267 through 27 November. The Aviation Color Code was raised from Green to Yellow (on a scale increasing from Green-Yellow-Orange-Red) on 27 November. In a daily report discussing activity on 27 November, KVERT reported that shallow events, possibly indicating ash explosions, had occurred during 1715-2000. The Kamchatka Branch of the Geophysical Service of the Russian Academy of Sciences (KB GS RAS) reported a strong seismic event at 1752 that day. Informed by KB GS RAS, the Tokyo Volcanic Ash Advisory Center (VAAC) posted a volcanic ash advisory at 1837 (table 1). The ash explosions prompted KVERT to raise the Aviation Color Code to Orange. Continuos tremor occurred for the rest of the day, indicating possible lava flows. Table 1. Summary of Tokyo VAAC volcanic ash (VA) advisories for Tolbachik during November 2012-January 2013. Plume heights are reported in km above sea level (a.s.l. ); '-' indicates data not reported. Note that the fissures are at approximately 1,600-1,700 m elevation, and not at the summit (3,682 m elevation), thus complicating plume height estimates. Yelizovo Airport is indicated as a data source by its airport code, UHPP. All times are local (UTC - 12 hours). Courtesy of Tokyo VAAC. Observations reveal two fissure vents. By the early morning of 28 November 2012, observers in Kozyrevsk (~40 km NW) and Lazo (~50 km SW) had reported periodic incandescence from Tolbachik during the night. 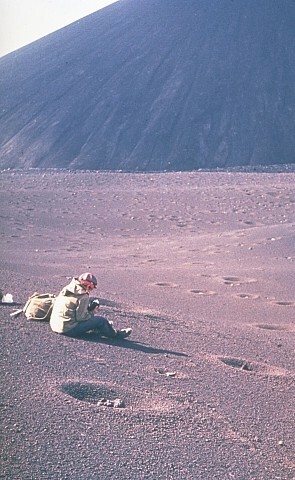 Later that morning, observers in the same locations reported ash explosions and lava flows in the area of the northern vents of the 1975/76 eruptions, along the W side of Tolbachinsky Dol. The first available photograph of the eruption showed that lava was issuing through two fissures (figure 2). Ashfall 4-cm-deep was reported in Krasny Yar (~60 km NNW) by midday on 28 November (figure 3). According to a KVERT information release, the Aviation Color Code was raised to Red for a brief period on 29 November, but this was not reflected in the daily reports; the Aviation Color Code remained Orange for the remainder of the reporting interval. Figure 2. The first available photograph of the Tolbachik dual fissure eruption that began on 27 November 2012. Fire fountaining through two fissure vents are seen generating ash plumes that reached ~3 km above sea level on 28 November 2012. Courtesy of Dmitry Melnikov (IVS FED RAS) and KVERT. Figure 3. Ashfall from Tolbachik was reported in Krasny Yar (~60 km NNW). Two deposits are distinguishable, separated by fresh snowfall; lens cap for scale. Courtesy of Y. Demyanchuk (IVS FED RAS) and KVERT. KVERT reported on 28 November that the N and S fissures were located 4-5 km and 6-7 km S of Plosky Tolbachik, respectively. Plosky Tolbachik is a shield volcano with nested summit calderas that makes up the E half of Tolbachik; the W portion of Tolbachik is the sharply-peaked Ostry Tolbachik stratovolcano (figures 1 and 4). At that time, Strombolian activity (figure 5) was observed at 4-5 vents in the N fissure and 2-3 vents in the S fissure; the very fluid lavas (figure 6) were flowing, often in 'lava rivers', to the W side of Tolbachinsky Dol (figure 7), and KVERT noted a large thermal anomaly over the N part of Tolbachinsky Dol (figure 8). Observers reported booming noises and vibrating windowpanes. Figure 4. Tolbachik viewed from the NNE on 13 December 2012, showing Plosky Tolbachik, the shield volcano, and its large, nested summit calderas on the left (E) and Ostry Tolbachik, the sharply peaked stratovolcano on the right (W). An E-drifting plume is seen rising from the fissure eruption on Tolbachinsky Dol to the S (in the background). Courtesy of Y. Demyanchuk (IVS FEB RAS) and KVERT. Figure 5. Strombolian activity during the eruption from the S fissure of Tolbachinsky Dol on 29 November 2012. Courtesy of S. Samoilenko and A. Sokorenko (IVS FEB RAS) and KVERT. Figure 6. Photographs highlighting the very fluid nature of lavas effused from the fissure eruption of Tolbachinsky Dol. (a) Fluid lavas from the S fissure of Tolbachinsky Dol flowing in a 'lava river' on 6 December 2012. A dog is in the foreground for scale. Courtesy of V. Yaschuk (KB GS RAS) and KVERT. (b) A 'lava river', presumably effused from the S fissure, flowing around a 'lava island' on 23 January 2013. Courtesy of Y. Demyanchuk (IVS FEB RAS) and KVERT. Figure 7. A false color infrared satellite image showing lava flowing W from the fissure eruption of Tolbachinsky Dol; snow appears green in this image. The fissure vents are hidden behind the plume in the N part of the image. To the S of the lava flow are cinder cones from the 1975/76 eruption of Tolbachik. The image was collected on 1 December 2012 by the Advanced Land Imager on the Earth Observing-1 Satellite; courtesy of NASA Earth Observatory. Figure 8. A MODVOLC thermal alert image for 29 November 2012 showing a large thermal anomaly over the N portion of Tolbachinsky Dol, resulting from the eruption of lava through two fissure vents. This image is a combination of multiple pixel alerts registered at 7 different times during the same day. Courtesy of the Hawai`i Institute of Geophysics and Planetology (HIGP) Thermal Alerts System. On 29 November, seismicity declined, and KVERT characterized the eruption as effusive; renewed seismicity occurred the next day, and a gas-and-steam plume with small amounts of ash rising to ~3 km was reported. Lava flows from the N fissure destroyed two scientific base camps located ~10 km from Tolbachik. Cinder cones grow on S fissure; new fumarole. A KVERT weekly report issued on 6 December 2012 noted that cinder cones were growing on the S fissure, and that lava effused from the S fissure had flowed up to 20 km away by 7 December. A fumarole was observed at the bottom of the Plosky Tolbachik caldera on 8 December (figure 9); this was the first fumarole observed in the caldera in ~30 years. On 9 December KVERT daily reports began stating that the effusion of lava was continuing from the S fissure, no longer mentioning the N fissure. Figure 9. A new fumarole that was observed in the Plosky Tolbachik caldera on 8 December 2012. KVERT reported that this is the first fumarole in the caldera in ~30 years. Courtesy of O. Evdokimova (IVS FEB RAS) and KVERT. By the end of December, KVERT reported that five cinder cones were growing on the S fissure (e.g. figure 10); by 10 January 2013, however, KVERT reported only four cinder cones on the S fissure. Figure 10. Strombolian activity within a cinder cone on the S fissure of Tolbachinsky Dol on 27 December 2012. The strombolian activity is feeding a lava river, flowing to the left. Courtesy of Y. Demyanchuk (IVS FEB RAS) and KVERT. As of early February 2013, the eruption continued to produce very fluid lava flows, four growing cinder cones, gas-and-steam plumes with variable ash contents that often reached ~4 km a.s.l. and drifted in various directions, and daily thermal alerts above Tolbachinsky Dol. Two examples of eruptive products from the eruption are shown in figure 11. Figure 11. Examples of eruptive products from the fissure eruption of Tolbachik that began on 27 November 2012 (ongoing as of early February 2013). (a) Vesicular lava sample (of unspecified dimensions and source location) photographed on 15 December 2012, displaying a very fluidal texture. (b) A volcanic bread-crust bomb photographed in situ (unspecified dimensions and source location) on 24 January 2013. Courtesy of Y. Demyanchuk (IVS FEB RAS) and KVERT. Information Contacts: Kamchatkan Volcanic Eruption Response Team (KVERT), Institute of Volcanic Geology and Geochemistry, Piip Ave. 9, Petropavlovsk-Kamchatsky, 683006, Russia; Tokyo Volcanic Ash Advisory Center (VAAC), Tokyo, Japan (URL: http://ds.data.jma.go.jp/svd/vaac/data/); Kamchatka Branch of the Geophysical Service of the Russian Academy of Sciences (KB GS RAS), Piip Ave. 9, Petropavlovsk-Kamchatsky, 683006, Russia; Yelizovo Airport (UHPP), Petropavlovsk-Kamchatsky, Kamchatka Krai, Russia; NASA Earth Observatory, NASA Goddard Space Flight Center (URL: http://earthobservatory.nasa.gov/); NASA Jet Propulsion Laboratory, California Institute of Technology (URL: http://www.jpl.nasa.gov/); Wikipedia (URL: http://www.wikipedia.org/). In our last Bulletin report (BGVN 37:12), we noted that nearly 36 years after its last eruption, the largest basaltic eruption in Kamchatka during historic times, Tolbachik began erupting again on 27 November 2012. The eruption emerged at two fissures situated along the W side of Tolbachinsky Dol (a lava plateau along the SW flank of Plosky Tolbachik), in the same area as the northern vents of the 1975/76 eruptions. The 2012 eruption produced both low viscosity and effusive lava flows, and its explosions generated low-level ash-bearing plumes. The Aviation Color Code remained at Orange until 27 August 2013 when it was lowered to Yellow. Edwards and others (2013) noted that at the vent on 25 January 2013, molten lava bombs shot more than 100 m above the crater floor. 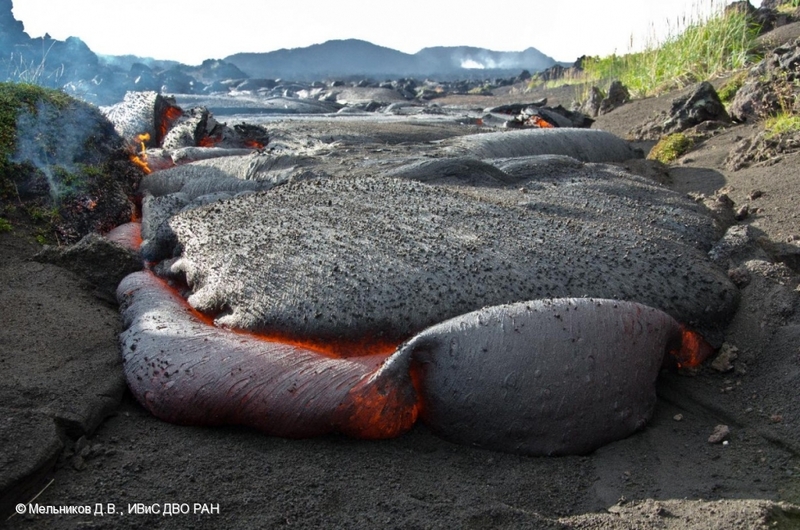 That reference also featured a mid-February 2013 photo showing a pahoehoe lava flow ~1 m thick. The authors stated evidence that the flow had advanced over the top of the snow. Lavas emitted were voluminous, highly fluid, and extended as far as 17-20 km from the S fissure (figure 12). Satellite radar data mapped the lavas, which first traveled radially away from the highlands, going S. At lower elevations, flows branched and traveled W as a series of anastomosing flows (Edwards and others, 2013). Figure 12. Map showing lava fields and the main vent (star) as of 15 February 2013. The lighting and shading effects show topography derived from a Shuttle Radar Topography Mission X-band digital elevation model (DEM; the technique applied here is called hillshade). Three older, preexisting cinder cones are shown as geographic reference points (Belaya Gorka, Kleshnya, and Krasny). Two areas where lava tubes are feeding surface flows are also indicated (orange circles with black centers). From Edwards and others (2013). According to Edwards and others (2013), observers on 29 November 2012 noted ash ejecting from two fractures as well as long, rapidly moving lava flows. Although the initial ash clouds reached 6 km in height, subsequent ashfall was limited to the area around the main vents. No permanent settlements were in danger from advancing lava flows since the closest settlements were about 40 km from the volcano. According to Mayotte and others (2013), the new Tolbachik fissure eruption began with the effusion and explosion of aluminous, K- and Ti-rich trachy-basaltic andesites. Those andesites were black and sub-aphyric, with rare phenocrysts of plagioclase, olivine, and clinopyroxene. Microlites of the groundmass contained pilotaxitic and hyalopilitic structures with dovetail shapes. The petrography of the volcanic rocks of the first days of eruption attests to very rapid cooling, high rates of eruption, and high lava mobility. On 19 December 2012, KVERT recognized that there were, by then, five cones with tops protruding above the fissure. In February 2013, four cones were reported. During mid-December 2012 to late August 2013, a very large thermal anomaly was reported on the N part of Tolbachinsky Dol. The thermal anomalies are congruent with the lava flows as well as the kind of venting behavior documented in figure 13. Figure 13. This helicopter view of the S slope of Tolbachik was taken 2 February 2013 by Denis Budkov. 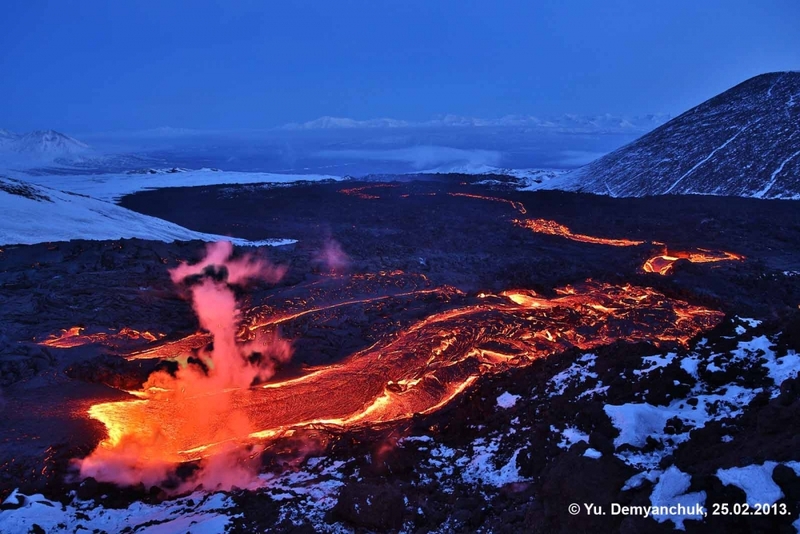 Tolbachik continued to produce lava flows during 4-15 January 2013 that traveled to the W and SE sides of Tolbachinsky Dol. Ash plumes rose to an altitude of 4.5 km and drifted in multiple directions. During 11-18 January, ash plumes rose to an altitude of 4 km and drifted in multiple directions. 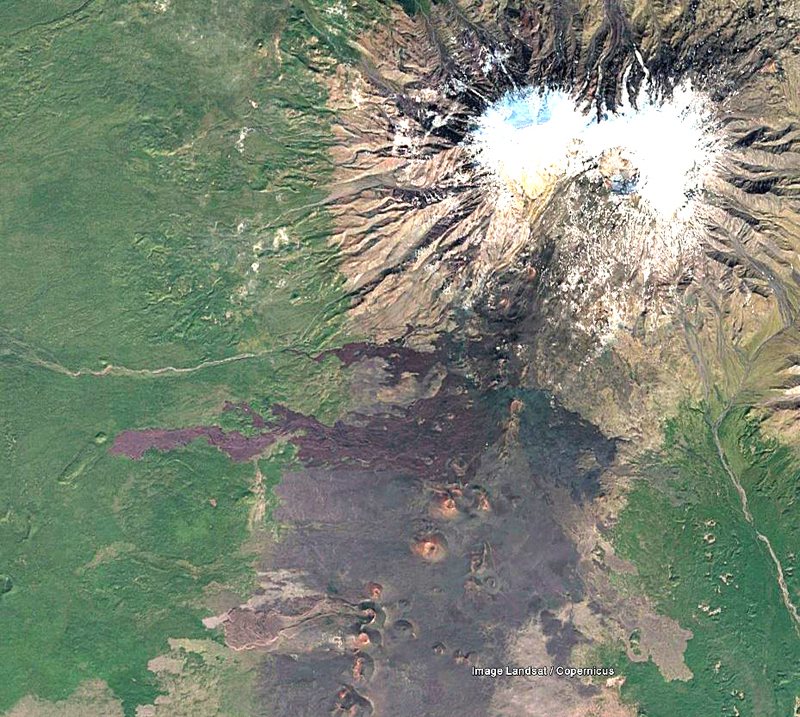 Between 25 January and 1 February 2013, four cinder cones continued to grow on the S fissure above Krasny cone. Ash plumes rose to an altitude of 3.5 km and drifted in multiple directions. Later, between 12 and 26 April, lava flows extended to the W, S, and E sides of the plateau. Cinder cones continued to grow along the S fissure through 16-22 August 2013. Gas-and-ash plumes rose to an altitude of 3 km and drifted in multiple directions. The following week, the plumes weakened and remained so through August 2013. Seismic activity decreased during 22-24 August. Local video images around that time lacked incandescence from the N part of Tolbachinsky Dol, although a thermal anomaly continued to be detected in satellite images. On 27 August the Aviation Color Code was lowered to Yellow. Overview of Eruption Activity from Edwards and others (2013). "Unlike the 1975 eruption, which was predicted 1 week in advance based on strong precursory seismicity at five seismic stations, the eruption that began in November 2012 was preceded by much weaker seismicity, so scientists were not able to predict this eruption. Earthquake hypocenters registered from more than 10 local seismometers were generally at depths of less than 10 kilometers and were mostly located below Plosky Tolbachik before earthquake activity migrated south to the eruption site . . .. Initial activity produced two primary fissures: a northern one, with four different active vents, and a southern fissure . . .. By the second day of the eruption, lava flows extended 9 kilometers from vent areas down into surrounding forests (Samoylenko et al., 2012). 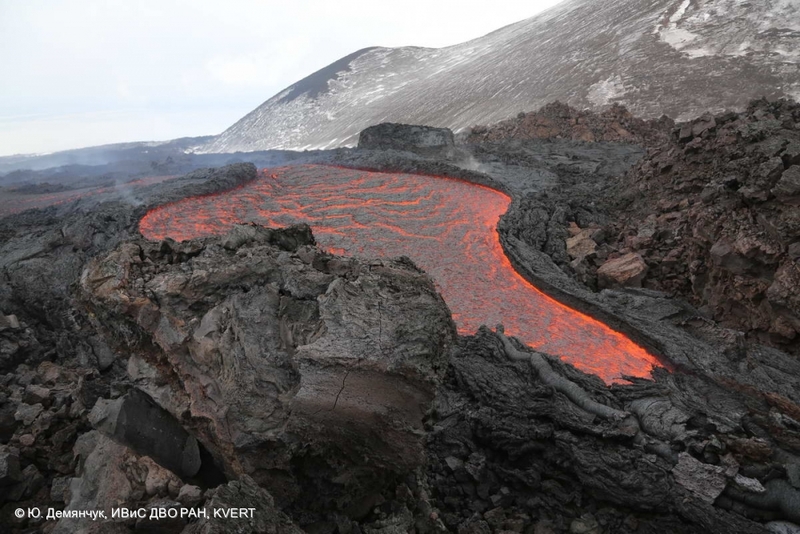 As of February 2013, weak explosive and effusive activity was ongoing at the main cone, and lava flows were active throughout the lava flow field from the southern fissure to Belaya Gorka, an older cinder cone 12 kilometers from the main vent (figure 12a). 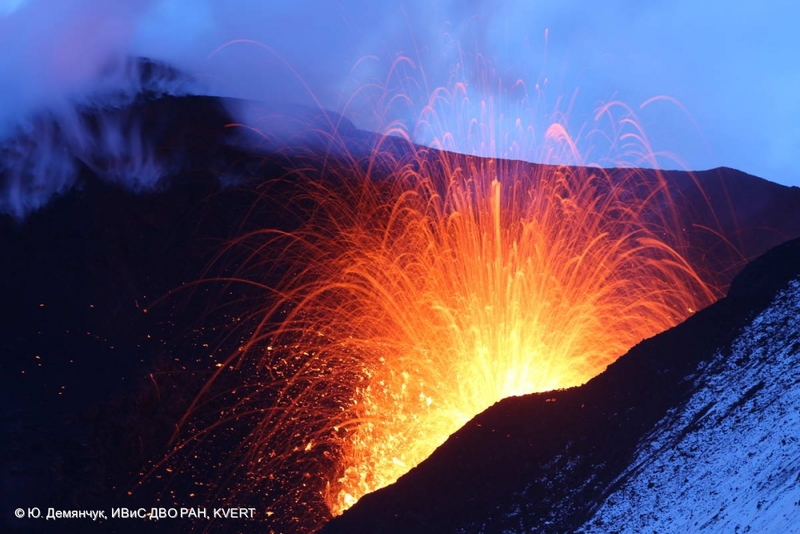 "Effusive and explosive activities have continued since the start of the eruption (figures 12c and 12d). Ash from the initial explosive activity was deposited up to 60 km west of the main vent area, and initial sulfur dioxide (SO2) gas emissions are estimated to have been approximately 60 metric tons. By late January, ash production was minor and the continuous explosions from the main cone had weakened. The highest lava flow rates at the surface (approximately 1 m per second) were near lava tube openings in the upper part of the lava field (figure 1a). The eruption is now [in early 2013] dominantly producing pahoehoe (smooth), slabby pahoehoe, and `a`a (rough) lava flows. Minor phreatomagmatic explosions were seen at the leading edges of lava flows advancing over snow during the first week of the eruption [Samoylenko et al., 2012]. During January and February, active `a`a flows were observed moving over snow in the lower part of the flow field, and reports documented heated meltwater discharge and active downslope flows. Lava- snow interaction continued as snow accumulated through the winter . . .."
Preliminary Petrology from Edwards and others (2013). "Lava and tephra from the start of the eruption have isolated large crystals of plagioclase with smaller crystals of olivine and clinopyroxene. Preliminary geochemistry shows that samples are basaltic trachyandesite, with higher concentrations of silicon dioxide (52-54 weight percent) than in the basalts that erupted in 1975-1976 (48-50 weight percent). Field measurements using thermocouples and infrared radiometers show that the surface temperatures of active lava streams seen in figure 1d are more than 1000°C." Comparison to the "Great Tolbachik" Eruption of 1975-1976 from Edwards and others (2013). "The new eruption shows striking differences compared to the 1975-1976 event. The seismicity at eruption onset was of lower magnitude and was confined to the crust (25 kilometers). 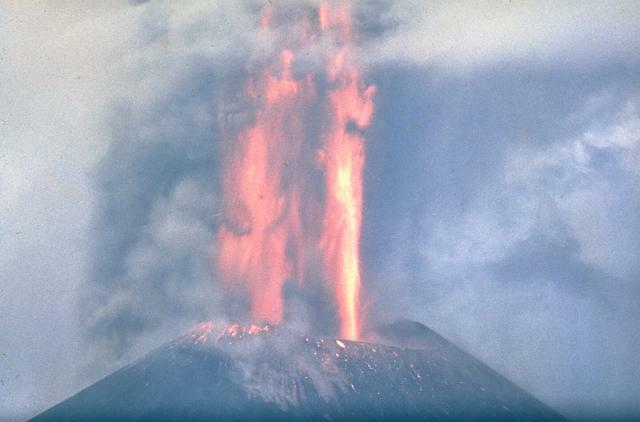 In its first 2 months, the present eruption has already produced more than 20% of the bulk volume of the 1975-1976 eruption, which lasted 18 months. Estimated lava discharge rates during early parts of the ongoing eruption were up to 400 cubic meters per second...."
References. Edwards, B., Belousov, A..,Belousava, M., Volynets, A., Melniknov, D., Chirkov, S., Senyukov, S., Gordeev, E., Muraviev, Y.,Izbekov, P., and Demianchuk, Y., 2013, Another "Great Tolbachik" Eruption? Eos, Vol. 94, No. 21, 21 May 2013, pp. 189-191. Volynets, A.O., Melnikov. D, Yakushev, A., and Tolstykh, M., 2013, Petrology and geochemistry of the New Tolbachik Fissure Eruption volcanic rocks and their evolution during the first two weeks of eruption, IAVCEI 2013 Scientific Assembly - July 20-24, Kagoshima, Japan (2013). Information Contacts: Kamchatkan Volcanic Eruption Response Team (KVERT), Institute of Volcanic Geology and Geochemistry, Piip Ave. 9, Petropavlovsk-Kamchatsky, 683006, Russia; and Denis Budkov, Photographer, Kamchatka, Russia (URL: http://ratbud.livejournal.com/). The massive Tolbachik basaltic volcano is located at the southern end of the dominantly andesitic Kliuchevskaya volcano group. The massif is composed of two overlapping, but morphologically dissimilar volcanoes. The flat-topped Plosky Tolbachik shield volcano with its nested Holocene Hawaiian-type calderas up to 3 km in diameter is located east of the older and higher sharp-topped Ostry Tolbachik stratovolcano. The summit caldera at Plosky Tolbachik was formed in association with major lava effusion about 6500 years ago and simultaneously with a major southward-directed sector collapse of Ostry Tolbachik volcano. Lengthy rift zones extending NE and SSW of the volcano have erupted voluminous basaltic lava flows during the Holocene, with activity during the past two thousand years being confined to the narrow axial zone of the rifts. The 1975-76 eruption originating from the SSW-flank fissure system and the summit was the largest historical basaltic eruption in Kamchatka. Braitseva O A, Melekestsev I V, Ponomareva V V, Litasova S N, Sulerzhitsky L D, 1981. Tephrochronological and geochronological studies of Tolbachik regional zone of scoria cones. Volc Seism, 1981(3): 14-28 (in Russian). Doubik P, Hill B E, 1999. Magmatic and hydromagmatic conduit development during the 1975 Tolbachik eruption, Kamchatka, with implications for hazards assessment at Yucca Mountain, NV. J. Volcanol. Geotherm. Res., 91: 43-64. Firstov P P, Ivanov B V, Karpukhina Y V, 1979. Temporal and energetical regularities of volcanic eruptions of Kurile-Kamchatka region in 1956-1976. Akad Nauk SSSR, Sibirsk Otdeleniye Byull Vulk Stantsii, 57: 3-11 (in Russian). There is data available for 60 Holocene eruptive periods. Reference List: Pritchard and Simons 2004. Two overlapping but dissimilar volcanoes form the massive Tolbachik volcano. 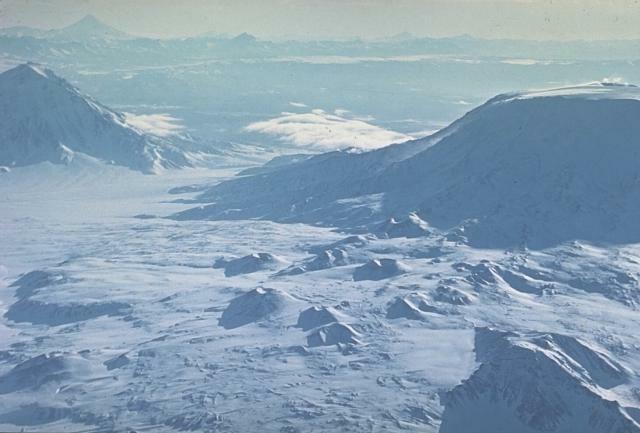 The flat-topped Plosky Tolbachik basaltic shield volcano (right), with its nested Hawaiian-type calderas up to 3 km in diameter, is located east of the older and higher sharp-topped Ostry Tolbachik stratovolcano (left). Lengthy rift zones extending NE and south of Plosky Tolbachik have erupted voluminous basaltic lava flows during the Holocene. The 1975-76 eruption from the summit and south-flank fissures was the largest historical basaltic eruption in Kamchatka. An ash-rich eruption column rises above the crater of a cinder cone along the south-flank rift zone of Kamchatka's Tolbachik volcano in late-July 1975. This cinder cone, the first of three large cones formed along the northern part of the rift zone during the early stage of the eruption, was only a few weeks old at the time of this photo. At times powerful lava fountains rose 1-2.5 km above the vent and ash columns reached 10-18 km heights. Photo by Oleg Volynets, 1975 (Institute of Volcanology, Petropavlovsk). Powerful jets of incandescent lava rise above the crater of a cinder cone along Kamchatka's Tolbachik south-flank rift zone in late-July 1975. This cinder cone, the first of three large cones formed along the northern part of the rift zone during the early stage of the eruption, began to grow on July 6. At times, powerful lava fountains rose 1-2.5 km above the vent and ash columns reached 10-18 km heights. 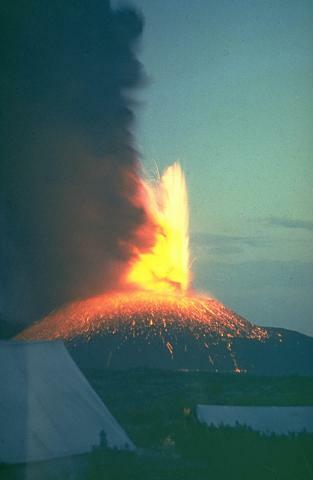 After July 27, eruptions from the first cone became dominantly effusive. Activity at the first cone ceased on August 9. Lava fountains rise above an eruptive fissure on September 20, 1975, two days after the resumption of eruptive activity 10 km south of the earlier activity on the northern end of the Tolbachik eruptive fissure. 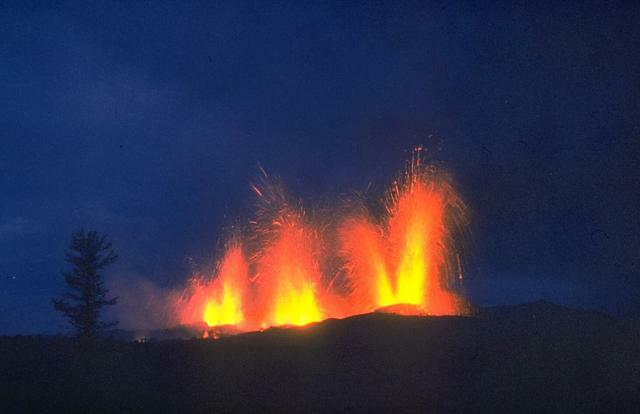 Activity at the southern eruptive breakthrough was dominantly effusive, and lasted 15 months, much longer than the three-month-long activity on the northern breakthrough. An incandescent blocky lava flow slowly moves along the base of a cinder cone in April 1976, igniting a tree already killed by ash and scoria ejected from the cinder cone. This was part of a lava field erupted from vents at the southern end of the 1975-76 "Great Tolbachik Fissure Eruption." Photo by Oleg Volynets, 1976 (Institute of Volcanology, Petropavlovsk). 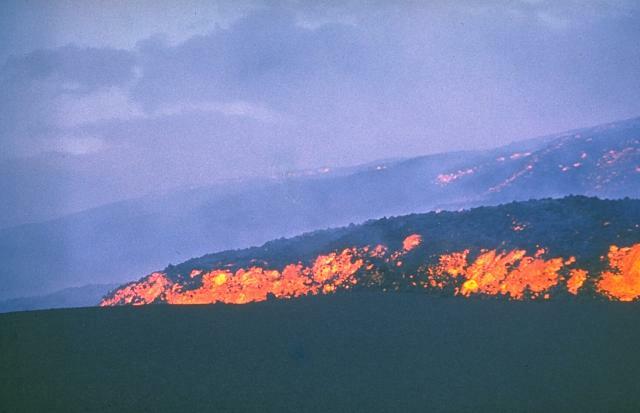 The glowing front of a lava flow advances across an ash-mantled surface in July 1975. Areas of incandescence can be seen in the main body of the flow behind it. 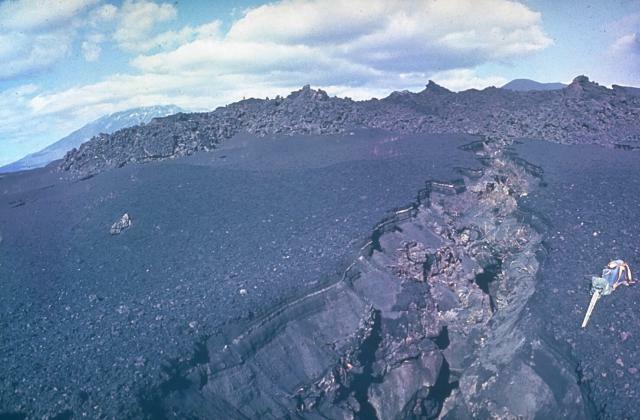 This lava flow, the first of the "Great Tolbachik Fissure Eruption" of 1975-76, originated from the first of three large cinder cones that formed at the northern of two principal zones of eruptive activity. Photo by Anatolii Khrenov, 1975 (courtesy of Oleg Volynets, Institute of Volcanology, Petropavlovsk). Incandescent lava flows from the southern eruptive center of the "Great Tolbachik Fissure Eruption" in January 1976. 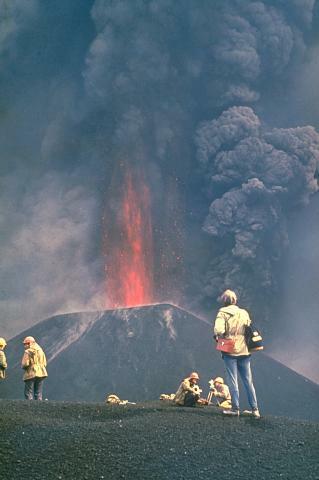 Eruptive activity from the southern center, which began on September 18, 1976, was dominantly effusive. By the time the eruption ended in December 1976, the southern vent had produced a lava field that covered 36 sq km to an average thickness of 28 m.
A scientist from the Institute of Volcanology studies scoria and ash from pyroclastic-fall deposits produced during the 1975-76 eruption of Kamchatka's Tolbachik volcano. The circular pits were formed by the impact of dense volcanic bombs into the soft pyroclastic-fall deposits. The blocks, one of which can be seen in the closest pit, originated from the cinder cone in the background. 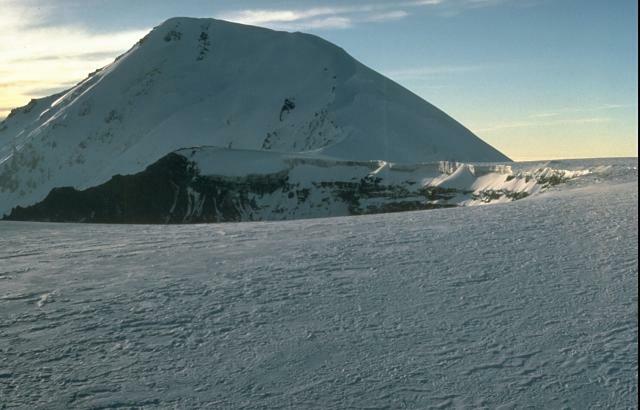 The summit of flat-topped Plosky Tolbachik volcano (right) is truncated by a 3-km-wide, glacier-filled caldera. Several lines of cinder cones dot a rift zone that extends NE from the basaltic shield volcano. Another rift zone that extends 70 km SSW of the summit has been the site of frequent basaltic eruptions during the Holocene, including the "Great Tolbachik Fissure Eruption" of 1975-76. 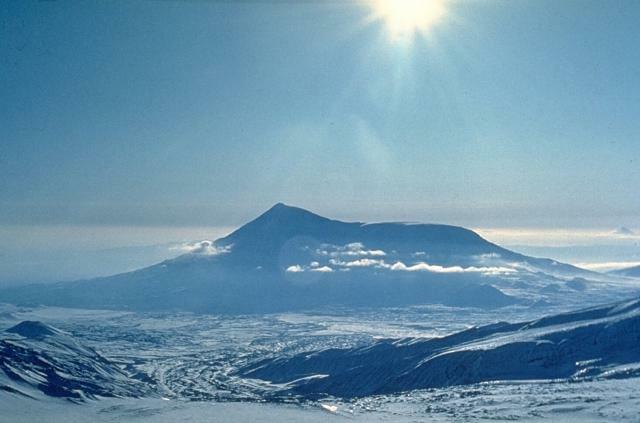 The conical peak of Udina volcano rises at the left, with massive Kronotsky volcano behind it on the far horizon. A powerful lava fountain and ash column rises above a volcanological field camp on Tolbachik volcano in July 1975. By the time of this photo, taken several days after the onset of activity along the southern rift zone of Tolbachik volcano on July 6, the newly formed cinder cone had grown to a height of 200 m. The upper flanks of the cone are blanketed by still-glowing volcanic bombs. 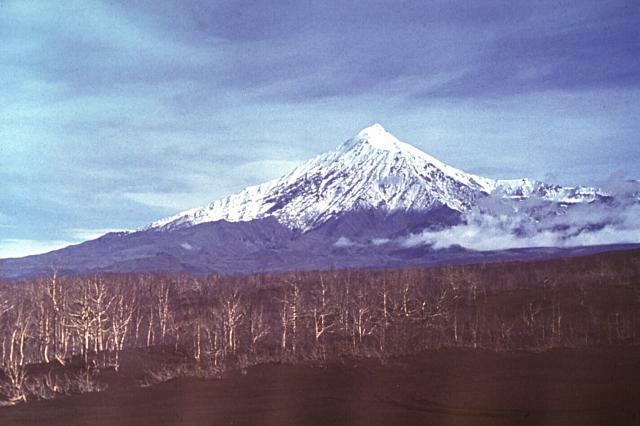 Photo by Yuri Doubik, 1975 (Institute of Volcanology, Petropavlovsk). 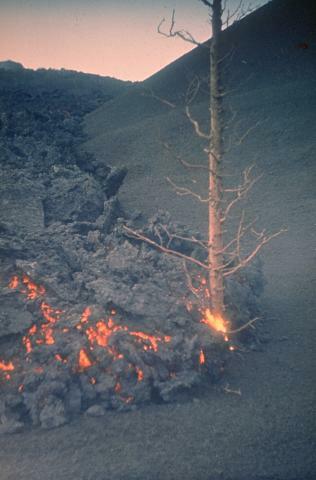 Ash clouds and incandescent lava fragments are ejected from a new cinder cone in 1975 during the largest historical basaltic eruption in the Kuril-Kamchatka arc. Following minor ash eruptions from the summit crater of Plosky Tolbachik on June 28, the "Great Tolbachik Fissure Eruption" began at a point 18 km south of the summit on July 6, producing a major explosive and effusive eruption that lasted until September 15. A dominantly effusive eruption began 28 km south of the summit on September 18 and continued until December 1976. A volcanologist from the Institute of Volcanology in Petropavlovsk exults at the sight of one of nature's impressive spectacles--a vigorously erupting lava fountain. 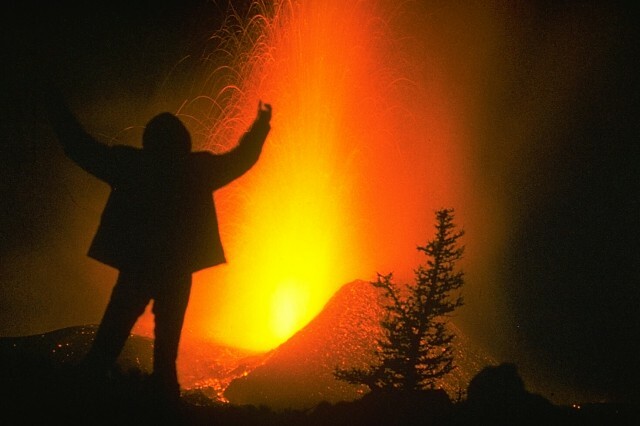 The eruption of Tolbachik volcano during 1975-76 was Kamchatka's largest basaltic eruption during the past 10,000 years, and provided scientists with a wealth of data. 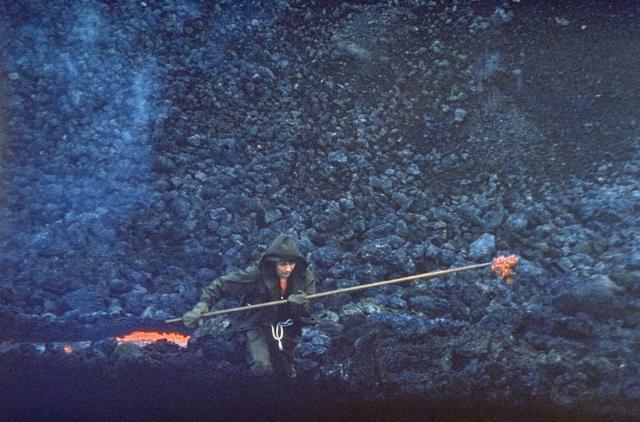 A scientist gathers a sample of molten lava from an eruptive vent at the base of a newly formed cinder cone in April 1976. Scientists from the Institute of Volcanology in Petropavlovsk analyzed lava samples throughout the eruption to determine the geochemical variation of eruptive products. The basaltic flow was one of several emplaced during a major SSW-flank eruption of Tolbachik volcano in 1975-76. 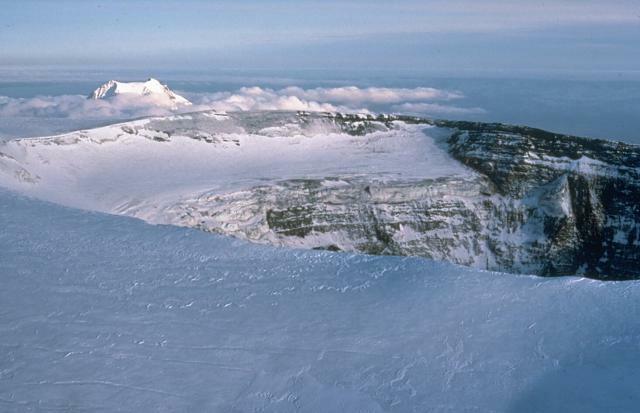 The summit of Plosky Tolbachik is truncated by a 3-km-wide caldera whose floor is covered by the glacier in the foreground. The outer caldera contains a nested inner, 1.8-km-wide caldera (center) with a pit crater that increased substantially in size during the 1975-76 eruption. Ostry Tolbachik stratovolcano towers west of the inner caldera of Plosky Tolbachik in this 1990 view. The inner pit crater within the summit caldera of Plosky Tolbachik volcano quadrupled in size during the 1975-76 eruption, most of which took place along the SSW-flank rift zone 18 km away. Collapse began on July 18, following minor ash eruptions beginning on June 28. By mid-September the diameter of the crater reached 1.2 x 1.6 km. The depth of the caldera increased from 230 m to 400 m. The summit of Udina volcano appears above the clouds to the SE. Sharp-topped Ostry Tolbachik is a basaltic shield volcano at the western end of the Tolbachik volcanic massif. The flat-topped Plosky Tolbachik shield volcano is partially obscured by clouds at the right. The 3682-m-high Ostry Tolbachik was active simultaneously with Plosky Tolbachik during the Pleistocene. The summit and flank of Ostry Tolbachik collapsed about 7000 years ago, forming a caldera breached to the SE. The trees in the foreground were damaged during a 1976 eruption from the rift zone south of Plosky Tolbachik. Large Eruptions of Tolbachik Information about large Quaternary eruptions (VEI >= 4) is cataloged in the Large Magnitude Explosive Volcanic Eruptions (LaMEVE) database of the Volcano Global Risk Identification and Analysis Project (VOGRIPA).